Yesterday, I saw an image that would have been perfect for that post. While there was a time when I would have regretted seeing or doing something “too late,” I’ve been changing my inner world enough to let go of regrets. As long as I’m still here and blogging, I can show you new things I experience, whenever I choose. Sharing that image with you — here and now — changed my inner world, in some way. Everything does. I am grateful I am alive each day, changing my inner world with every breath. How do you change your inner world? World-changing thanks to all those appearing in this blog today, to my friend and co-worker Mark for capturing Friday night’s performance (as instructed), to Ali the harpist, to my fellow social workers for the vocal support, to Maria from WordPress for helping me upload The Lion Sleeps Tonight at YouTube a day “late” (and with perfect timing), and to you — of course! — for changing my world, each time you visit. oh the video says I need to sign in to watch! perhaps you need to change the settings. I love to read the sentiments on headstones, sad but touching. I just changed the world of that video by making it public. Thanks for changing my world with this comment! This improved my inner world, big time. Thanks so much! I will try to remember to watch the video when I am somewhere with decent internet one day. Dead, wow! Cemeteries fill with people, food music, and tequila. I love to visit then. Day of the Dead who demanded to know what I was doing at the cemetery. When I explained that I had no one there but just wanted to visit, she grabbed me and took me to meet her deceased husband to visit with him awhile. “Now you have someone to visit here,” she said. Thanks for improving the world here with your experience and with that story, Emilie! Good job, Ann! Very crafty how you instructed your camera person to exclude you from the video! Nice boots, but other than that, we could see nothing of you. 😯 You sounded good, very nice soprano voice! And the courage to sing publicly is significant. Good for you! I also found the gravestones touching, especially the one written by its young honoree before she died. Poignant. I am very crafty, aren’t I? Thanks for noticing that part of my inner world and for the kindness you showed here. It was so wonderful to hear your voice again after so many years. Did you play the piano for your fellow Therapists, my multi-talented friend? I did not play piano that night, my multi-complimenting friend. Wonderful to see you here, Beth. I don’t know why, but I knew you had a beautiful voice, and I was right. You also picked an extremely challenging song, with so many variants in tonalities, you’re brave! Thanks for sharing another one of your talents! Thank you for your kind compliments, Maria! They mean a lot to me. I love the way you change my inner world, Millie, especially today! Ann singing changed my inner world today… SMILE 🙂 Your have a pretty voice Ann! Thank you for your inner-world-changing comment and smile, dear Val! I apologize for being so involved with my inner world that I missed your comment! Many thanks for the exciting visit. More confidence than ‘Pretel Logic,’ Ann, and with many more moving parts. Way to go. Your voice has its soprano level, and dance it with the angels. Yes, you were crafty with your video instructions, my friend. Nice boots, indeed. Your cemetery shots were thought-provoking. Great post today, in the present and a day later than intended. My inner world is comforted. Mine is comforted now, too, Mark. Many thanks. I’m so glad this post made you think and reflect, Joanne. That — and your compliment — helps my inner world. Oh, Ann! You have a heart-liftingly lovely voice. I loved hearing you lead your friends in The Lion Sleeps Tonight! I felt filled with love and hope and serenity as I heard this song. There’s something about your voice and the harp (and, of course, the social worker chorus). Thank you for overcoming your fears to do this and, even more, for posting it so that those of us who live far away, maybe even a little too close to the lions, can hear it. You lift my heart, as usual, Maureen. Love to you, from these inner and outer worlds. The lion shines tonight, thanks to you! NEITHER FEAR NOR BEING “LATE” WIIL STOP US FROM EXPERIENCING LIFE’S INNER JOYS! Thank you, Jonathan, for all the good work you do in the world! Congratulations! You’ve a beautiful voice, Ann. How do I change my inner world? I no longer take life for granted. Connect with friends when I start to hide myself away. I tell myself that Rome was not built in a day. That thru the forest there is a thicket, and within that, there are beams of sunlight. You’ve changed my inner world for the better in many ways, with this comment. Thank you. When I saw this video, I was extremely touched. Sometimes there are amazing coincidences in life – too unbelievable to be simply chance. Perhaps you found my blog because my deceased son, Jason had the same congenital defect that you have (Transposition of the Great Vessels). Now here’s another. My son lived to be five-years old and had an absolute favorite song. It was “The Lion Sleeps Tonight.” It’s hard for me to hear that song without tearing up. You have a beautiful voice and that video moved me. Especially because it represented courage for you. I am very moved by all of this. You are awesome! 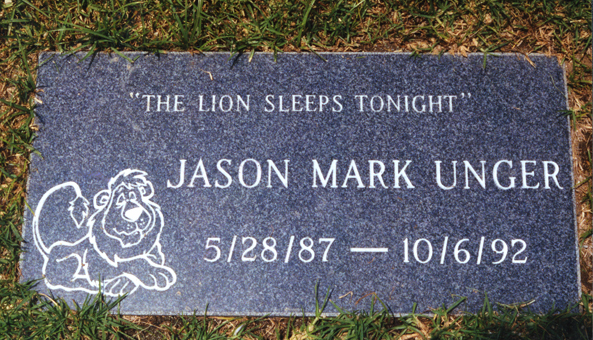 I was very touched and teary-eyed when I saw that photo of Jason’s gravestone. Thank you so much, Judy, for sharing that and your kind and beautiful thoughts. And while my heart is somewhat different from Jason’s (I have congenitally corrected transposition), this heart is so grateful to connect with you here, Judy. Ditto! And it’s all because of hearts that we are connected. I had to share puns with you about Sandra Callahan’s battery change and now I see you’re following her journey. All of this is very inspiring and uplifting. Love your blog and how you capture life in a beautiful way. Congrats! In changing you inner world you have had a positve effect on the outer world; the world in which those you hold dear live. The smiles on their faces confirm a lightness of heart. A good time had by all would not have been, had you not had the courage to change within. p.s. With the booze flowing, the lion wasn’t the only one sleeping that night! Thanks for this lion-hearted comment, Alan! I am very grateful that you are in my world. Well done, I’m in total awe. So brave! You, as usual, improve my inner and outer world, Hilary! Thanks for seeing bravery in me.